I’m not a hot seat guy. I’m not about to sit here and pretend that I know that ins and outs of every single coach’s job security. There are relationships with athletic directors, both public and private, that have way more of a bearing on a coach’s job than the general public realizes. For that reason, I try to refrain from assuming a coach is on the proverbial hot seat, unless we hear or see a comment from an athletic director that sheds some light on that. I am, however, a perception guy. That is, I have interest in whether a fan base believes in a coach as the long-term fit. Everything I’m about to discuss as it relates to Will Muschamp is based on perception. Right now, there seems to be a fair perception of Muschamp. 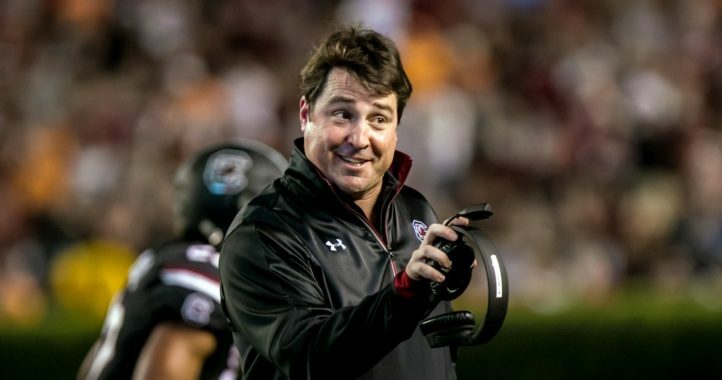 He deserves a ton of credit for cleaning up the mess that Steve Spurrier left in 2015, yet it’s fair to wonder if Muschamp’s teams can ever get to the level that Spurrier’s did in Columbia. We’re entering Year 4 of the Muschamp era, and there’s a major hurdle for him to overcome. The perception is going to be that South Carolina has a difficult 2019 schedule. Why? It’s basically as brutal as an SEC East schedule can get. 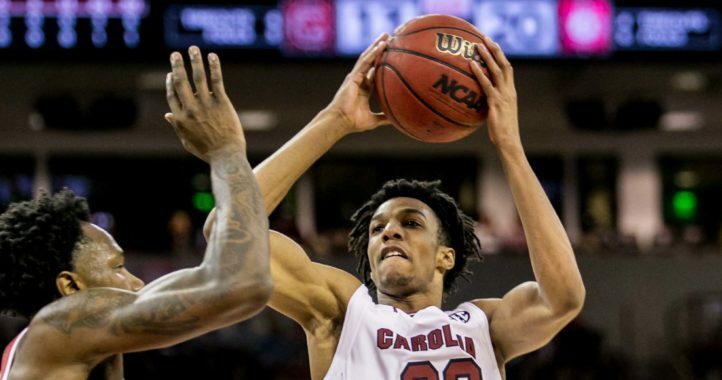 The Gamecocks have crossover draws against preseason Top 10 teams Alabama and Texas A&M. They’ll also travel to Georgia and host a Clemson team coming off one of the most dominant seasons we’ve seen in the 21st century. There’s also the matchup with preseason Top 10 Florida — that’s 5 games vs. preseason Top 10 teams if you’re keeping track — as well as an early-season trip to preseason Top 25 Mizzou. There’s also a date with the Kentucky team that Muschamp is 0-3 against, and South Carolina opens with North Carolina. Even though the Gamecocks will be favored to beat UNC and spoil Mack Brown’s return to Chapel Hill, that means South Carolina is one of the few SEC teams with 10 games against Power 5 teams in 2019. Starting to get the picture? South Carolina’s schedule is daunting. Like, get up to the podium at SEC Media Days and declare it the toughest in the nation daunting. Muschamp’s history against quality opponents suggests 2019 will be more of a mountain than a hurdle to clear. And actually, Muschamp went 4-2 vs. ranked opponents during his second year in Gainesville. So in the 6 years excluding that 2012 season, he is 2-22 against ranked teams. South Carolina, as you recall, has an SEC-most (tied with Auburn) 6 games against teams that are ranked in ESPN’s Way-Too-Early Top 25. You can argue that those aren’t necessarily perfect indicators of actual strength of schedule, but for the next 7 months, it’s going to look like the Gamecocks have a gauntlet. I mean, 5 preseason Top 10 opponents are on the schedule, including the top 3 in ESPN’s early rankings. Yowza. When the 2019 season kicks off, it’ll have been nearly 3 years since Muschamp’s last win against a ranked opponent. You won’t see that in any “here’s why you should believe in Muschamp” argument. What you will see is that he’s coming off 3 consecutive bowl berths. You’ll see something about how Muschamp’s teams in 3 years have a .500 record in SEC play, which isn’t bad considering the Gamecocks were 4-12 in SEC play in the 2 seasons before he arrived. 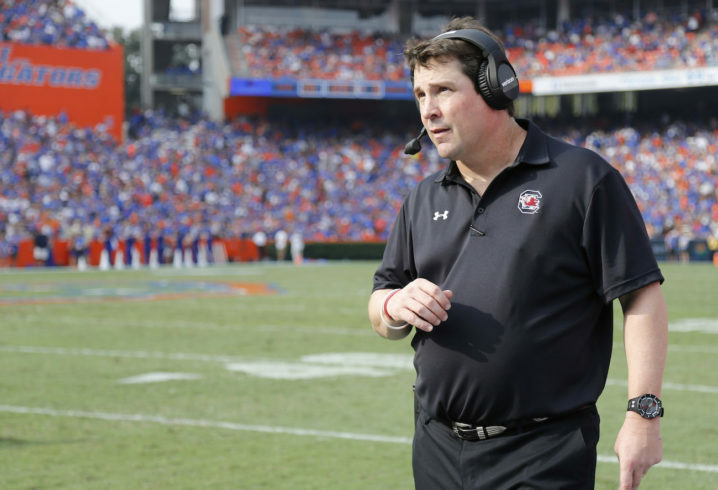 If Muschamp gets off to another mediocre start and there are some talks about his long-term future, the supporters will point to Spurrier not getting to the 9-win mark until Year 6. Muschamp, as you recall, already did that (it still counts even if he didn’t beat a ranked opponent to get there). The difference between the two coaches, obviously, is what they did at Florida. Spurrier’s track record in Gainesville was what allowed him to get patience. And well, let’s be honest. South Carolina, the program that had just 5 Top 25 finishes before Spurrier arrived, wasn’t firing the HBC. 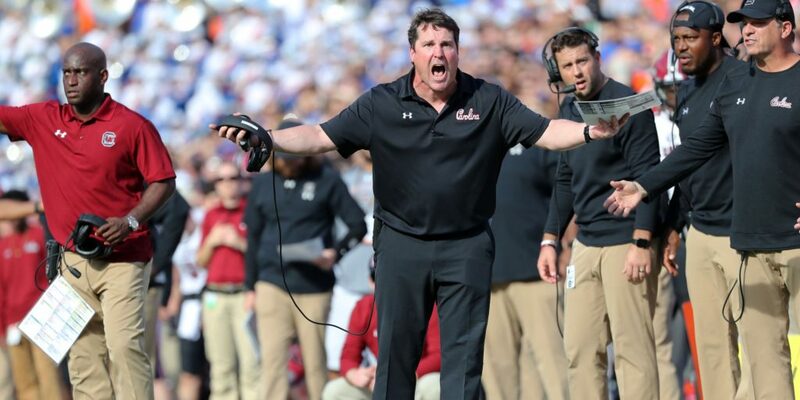 That’s not to say Muschamp needs to get to Spurrier’s level or the Gamecocks should move on. If Muschamp’s bar to meet is 3 consecutive Top 10 finishes, well then that’s just not realistic, especially considering what he inherited. Obviously he would want to get to the point where the Gamecocks look like yearly SEC contenders, but getting past both Florida and Georgia on a yearly basis looks more challenging than it was at any time in the last decade. It’s because of that reality that unlike in 2018, nobody outside of Columbia is going to pick South Carolina as a sleeper to win the division in 2019. There’s the flip side of that. Perhaps that can work in Muschamp’s favor. The 2018 season was deemed a disappointment because South Carolina’s schedule looked favorable and with Jake Bentley and Deebo Samuel back, there was hope that a 9-win team could take that next step. Eight wins with this tough of a schedule would be taking that step for Muschamp. A couple wins against teams like Texas A&M or even Florida would be a sign that while South Carolina isn’t poised to be a juggernaut, it can sneak up on teams and play with just about anyone on any given day. That’s the perception Muschamp wants by season’s end. He’ll earn a tip of the cap if he can get it. Connor O'Gara is the senior national columnist for Saturday Down South. He's a member of the Football Writers Association of America. After spending his entire life living in B1G country, he moved to the South in 2015. The schedule makers didn't do South Carolina any favors in 2019. Muschamp has a daunting task, but he at least has a good reputation so far. Everyone that plays him knows they will be in a dog fight. As was said many times three years ago: Thanks SC for hiring Muschamp before Georgia could. McGarity could never have gotten away with firing Richt to hire Muschamp after he was at Florida. Of course the opening at USC was supposedly what prompted the change. Boosters were concerned Smart might go there. The results wouldn’t be drastically different. You will likely always out-recruit us. From tradition to location to brand, Georgia is always going to have a self-recruiting element that is hard to overcome. Kirby would have similar results to Muschamp at South Carolina so far, if I had to bet. We’ll never know, and I’m not claiming the”exact” same results, just not as different as you might imagine. Agree. It’s astounding that uga hasn’t had more success in the past with the amount of talent in their state. I do think Muschamp would be achieving similar things as Smart because both are good football coaches. But Muschamp had similar type players at Florida and failed to capitalize on that talent. Jim Mac won the east twice with Muschamp players! Why so far it appears you have Butch Jones 2.0 on the sidelines except he inherited a better program. How much longer until the perception changes in Athens, Smarts a hell of a recruiter, but recruits will get tired of looking at Smarts Tide championship ring and start to wonder where the Dawgs NC ring is. My question is when does GA give up on Smart, you fired a 10 win a season coach for guy who hasn’t paid off yet as far as going to the next level. Do you ever post anything positive? Come on man! These are really good coaches. Agree that Smart has better players and would prob have similar results as Muschamp if roles were reversed. I post positive things all of the time, just calling out the trolls. You can’t deny there is truth to my statement and my question of perception for GA is as reasonable as the question of perception for SC given the programs these coaches took over. What are u talking about? Kirby has achieved so much more in three years than Butch Jones did his whole time at Tennessee. Also Kirby has us competing for the playoffs. If Richt was still here we would still be winning 9 or 10 games but not in the discussion for championships. U say Kirby hasn’t taken UGA to the next level! That’s crazy, Kirby has UGA at a level Mark Richt never achieved. A championship contender each and every season! You were in championship contention 1 year and lost. Not exactly a yearly contentender. You have 1 SEC Championship and Kirby is already slipping and with all that talent. Richt had a .740 win percentage at GA, Kirby’s at .762 not much of a difference. Like Jones, Kirby can recruit, but look at the 3 losses this year, beat down by LSU, outcoached again by Saban, and could not get the team motivated against a less talented Texas team, just like butch Kirby’s teams are not finishing at the rank of their recruiting classes indicate. So when does GA decide it’s enough and move on, or when do you expect him to win a NC? Nice piece. It about sums it up. I haven’t given up on Champ yet, I don’t think too many have. He finally started getting the players he needs for the defense, which we of course thought would happen sooner. The prevailing thought in Columbia when he came in was that if he had an offense, he would be hell on wheels. Then it was the defense that wasn’t getting it done…in relative terms. He had a roster to rebuild on both sides of the ball. That’s a brutal schedule. Hard to see many wins but you never know. He has had our number everywhere he has been. Hopefully that changes in 2019. Keep hoping, but it looks doubtful. Ya that’s real positive. Now who is the troll? I told him to keep up hope, lol just read your comments, seems you should follow your own advice. All of these guys are good coaches. We’ve spent and continue to spend…we have caught up and surpassed many with facilities. Just look at the recruiting rankings. That tells you all you need to know. Spurrier had too 10 classes. We competed then too. If you’re at the back half of the SEC and not in the top 10 nationally you could have Vince Lombardi and it wouldn’t matter. I believe we’re also ranked around 15th in the country for both facilities and most valuable programs. Bottom line is you got to have the horses. Agree that need the players, but you’re wrong about Spurriers classes. We might have had one top 10 class with Spurrier and most fell around the 20 range. Fact is we have never recruited from a rankings perspective higher than currently are. Our 2019 class that just finished had the highest AVG player rating we have ever had. Muschamp has improved that every year. And yes we competed back then at a very high level I think recruiting matters but also have to hit on some some rated players and coach/develop them. Our 2010 class was rated 34th by the 247 composite and included Lattimore, AJ Cann, Victor Hampton, Connor Shaw, Ace Sanders, Cory Robinson, Byron Jerideau, Kelly Quarles, and Brison Williams. Those guys all were big parts of successful teams. Per the 247 composite- 2007 was 7th, 2008 was 35th, 2009 was 14th, 2010 was 34th. Never in any of those classes was our AVG higher than what it was in this past class. Bottom line is that you need the horses and need to coach and develop them. It can be done but it is an uphill battle. If you can be successful on the line of scrimmage and find a good QB it makes competing at the highest level possible. And you’re right – we have the facilities to do it. Just have to keep improving. I admire what Muschamp has accomplished at SCar so far. I thought your defense would be decent this year, and that’s why I had a lot of confidence that y’all could win 9 games. The defense didn’t have the horses to compete, and you guys lost games because of it. It’s more like we didn’t have bodies it’s hard to put a defense on the field with 13 injured players on the D.